As we plan and decorate our homes, there is more often than not one space that gets neglected and passed over in the design stakes. As well as the bathroom, the utility room, and some of the less desirable to decorate areas of one’s abode, the entrance area is definitely omitted and excluded. 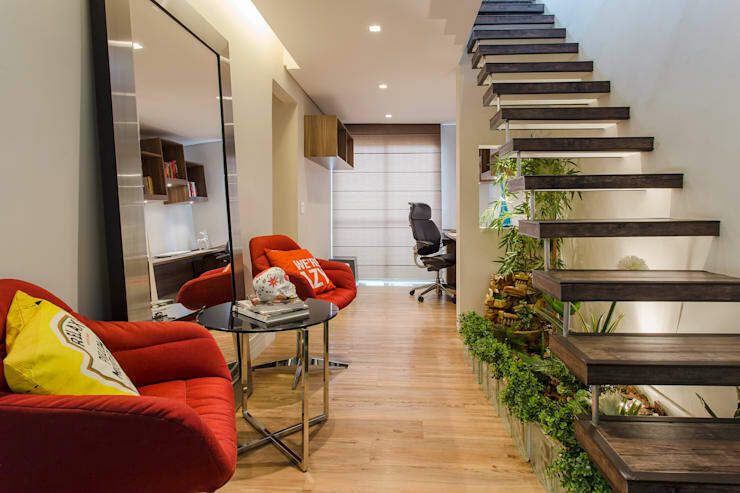 However, this crucial space is an area that can actually work in a functional, practical and stylish way, while imparting a sophisticated purpose upon its abode. But where does one begin? In most homes there are plenty of different factors to consider. Generally the space is small and cloistered or open and troublesome. 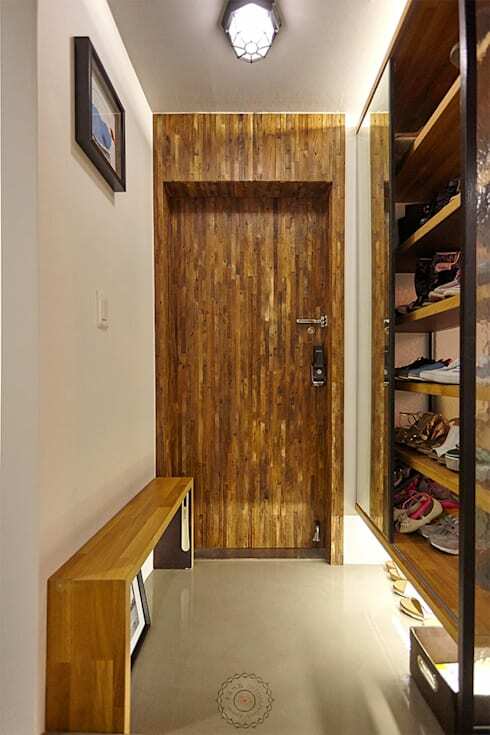 In many instances, a large and open interior entrance space can seem tougher to decorate and design than its cramped counterparts. 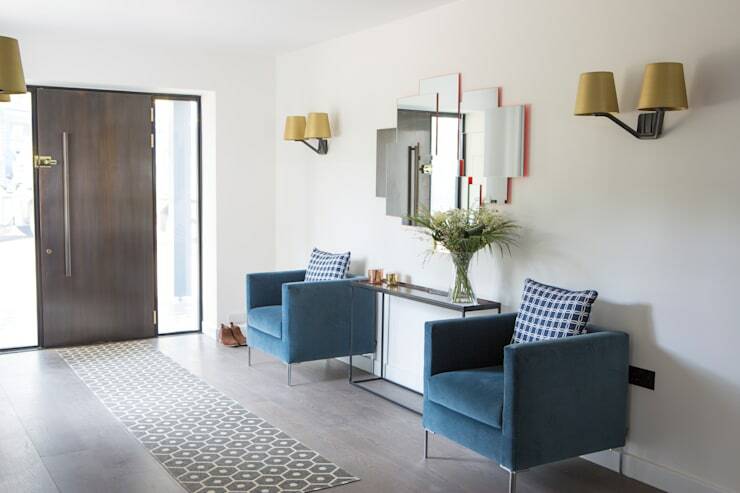 Without further ado, we’ve gathered 10 chic internal entrance spaces that are sure to inspire a few ideas and concepts. Read on below and start transforming your home today! First up, we peek inside an entrance that offers built-in storage, a gorgeous light feature, and shelves to display accoutrements and ornaments. 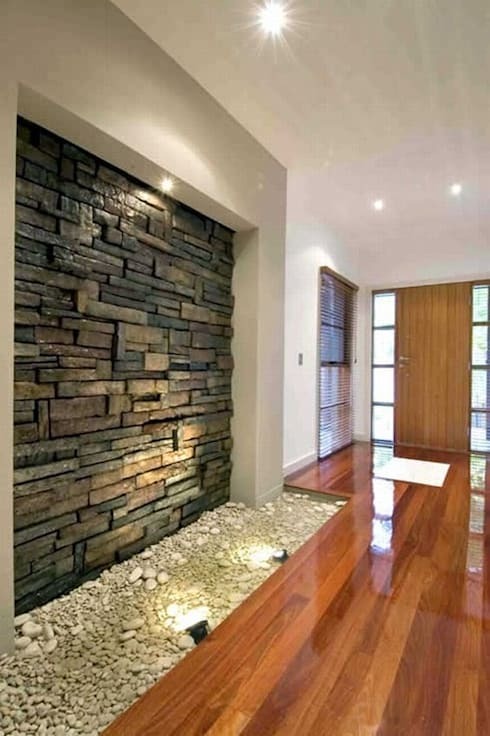 Add interest to your internal entrance by including a feature wall of stone. This example has been illuminated by individual lights and works well in offering a sleek and engaging entrance area. Most entrance spaces are void of practicality; empty and left to function as simply a space in one ingresses and egresses from their abode. However, this area can definitely offer more, and this colourful, engaging and interesting space shows us how! 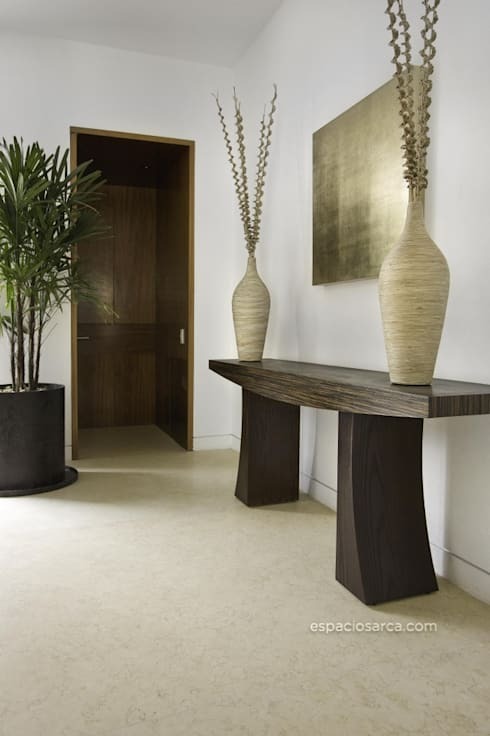 Rich, raw and luxurious, this space embraces earthy hues and textures to offer a wonderfully sophisticated aesthetic. 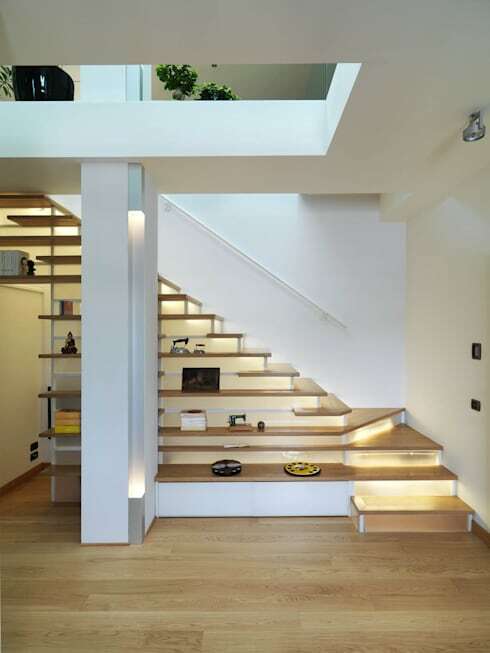 Make your entrance and internal door area practical by adding some shelves to your staircase. This illuminated demonstration is chic and usable, adding a thoughtful and considered ambience. 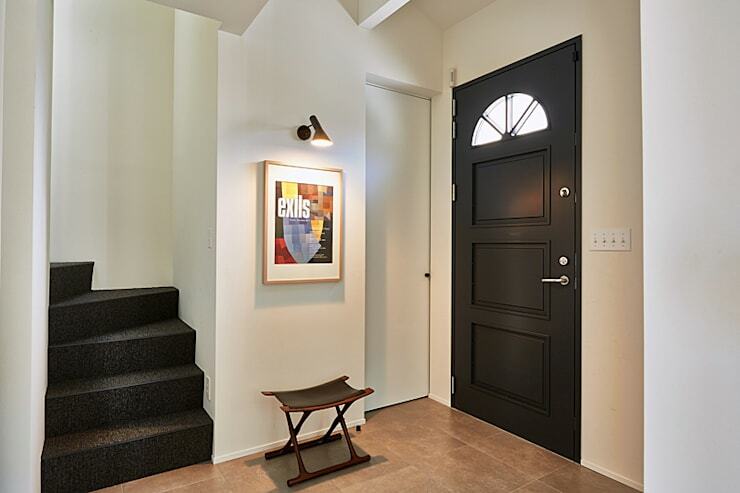 Black and white goes hand in hand, and can work beautifully for your internal door area. Make the space stand out, while ensuring it is designed to look its best by employing two bold and dramatic hues. Want to step inside a serene and welcoming atmosphere when you arrive home? 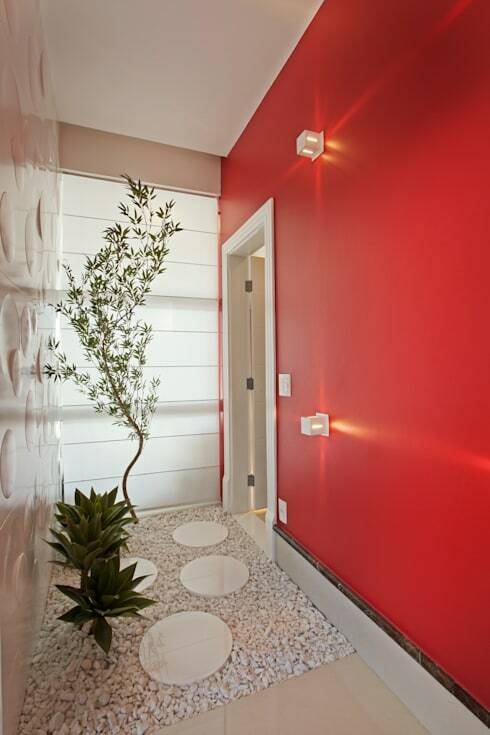 Check out this Zen example that truly rethinks what an entrance and internal door area can be. For something simple and achievable take a peek at this next setup. 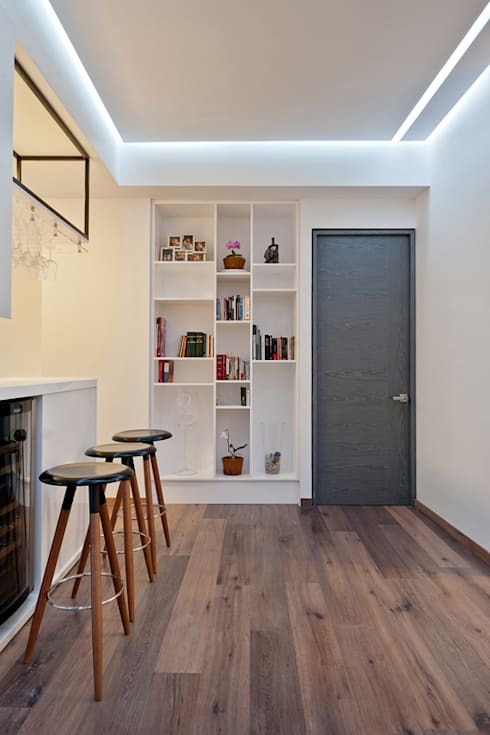 With a built-in bookshelf, a painted grey front door and a white colour scheme, this open and seemingly difficult to design area is now practical and useful. 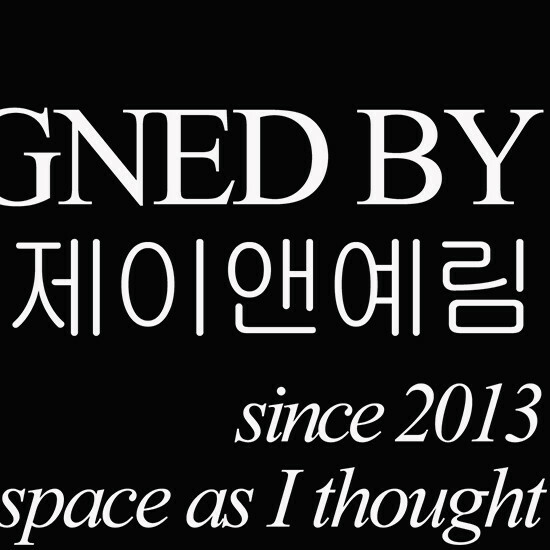 If you have a larger space to work with you can get a little creative with your design. In this next example, the designers have opted for two statement seats, a large mirror, console table and wall-mounted lights. This entrance is small, cloistered and cramped, but that hasn’t stopped it from being usable and liveable. There is a small bench to sit on while putting on shoes, while these are located in the floor-to-ceiling shelf adjacent. Which of these entrance ideas would you pick?